This view in approximately true color reveals details in an impact crater informally named "Fram" in the Meridian Planum region of Mars. 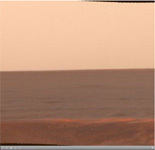 The picture is a mosaic of frames taken by the panoramic camera on NASA's Mars Exploration Rover Opportunity during the rover's 88th martian day on Mars, on April 23, 2004. The crater spans about 8 meters (26 feet) in diameter. Opportunity paused beside it while traveling from the rover's landing site toward a larger crater farther east. This view combines images taken using three of the camera's filters for different wavelengths of light: 750 nanometers, 530 nanometers and 430 nanometers.